The chief of Tibet’s Communist party, Chen Quanguo, explained that China’s Government will not tolerate any support for separatist activities or the participation in Tibetan religious life by party members. Although the Constitution protects the freedom of religion, the Communist Party is officially declared as atheist and therefore, its members are not allowed to partake in religious activities. A top Chinese official has vowed to severely punish members of the ruling Communist Party in Tibet who "harbor fantasies" about the troubled region's exiled spiritual leader, the Dalai Lama, state media said on Wednesday [5 November 2014]. In a front-page article in the Tibet Daily, Tibet's party chief Chen Quanguo said China would stamp out any separatist inclinations. "As for cadres who harbor fantasies about the 14th Dalai Lama, follow the Dalai Group, participate in supporting separatist infiltration sabotage activities, (they will be) strictly and severely punished according to the law and party disciplinary measures," Chen was quoted as saying. Chen's denunciation of the Dalai Lama signals a hardening stance against the Nobel Peace Prize winner whom they label a "wolf in sheep's clothing" who seeks to use violent methods to establish an independent Tibet. 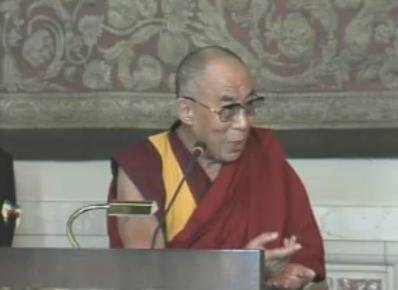 The Dalai Lama had expressed hope last month [October 2014] about making a pilgrimage to China, saying that he had discussions with Chinese officials about a possible trip, according to media reports. Human rights activists say China tramples on religious freedom and culture in Tibet, which it has ruled with an iron fist since People's Liberation Army troops "peacefully liberated" the region in 1950. Photographs of the Dalai Lama are banned in what China calls the Tibet Autonomous Region. Chen's comments could also signal a broader clampdown on religious freedoms in China. The Central Commission for Discipline Inspection, the party's discipline watchdog, which recently sent an inspection team to eastern Zhejiang province, said it found "several party members who were religious believers", the website of the People's Daily, the party's official mouthpiece, said late on Tuesday [4 November 2014].